The 'Zed' pack has 18 books which contain the first 45 high frequency words with symbols to support the text. The series of books is introduced with a story called 'An Alien in my Bath' which is for the adult to read. The graphics are interesting and stimulating and the content is more suitable for older pupils than other resources available. There are some students who struggle to learn the first 45 high frequency words and schools often have limited material with this vocabulary. 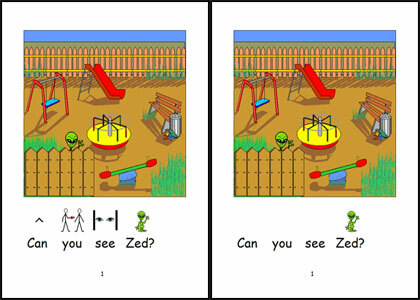 The Zed books use symbol support to aid word recognition as well as providing visually stimulating graphics. The books cover topics about real life experiences and students are motivated by the characters who include Zed, a green alien. Students begin to see themselves as 'readers' which improves self esteem and their ability to learn. I was working with 'Sam' - a boy in Reception with limited expressive language and speech difficulties. Sam chose 2 girls - Laura and Amy - to join him in the reading activity. The girls are both able to read many words independently but Sam as yet recognises only a couple. Sam and the girls were using Group1 Set 1a booklets. Sam was able to read 'I can see' and 'Come and See' booklets 90% unaided and really enjoyed them. The girls listened to Sam reading and read other booklets themselves. After the session Sam proudly told the teaching assistant 'Me read with Laura and Amy'. I think his use of the word 'read' is really positive- he saw himself as being able to do this just as well as the girls.